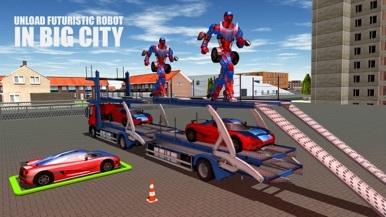 Enjoy a brand new multi truck robot transport game of 2017 in an amazing big city where futuristic robot cars and giant futuristic transformer steel robots are ready for transportation to the other end of the big city. Police Car Robot Superhero-Transport Sim is a treat for robot car lover and truck game freaks as you can mark your name in the best transport driver hero of 2017. 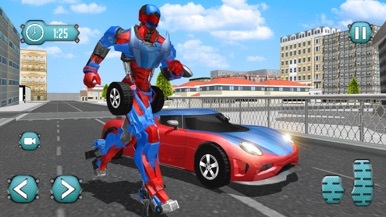 Police Car Robot Superhero-Transport Sim will let you enjoy an extreme driving adventure where you can drive super futuristic robot cars at high speed on vast roads of big city and show extreme speed drift power as an expert car driver. Park the furious cars on monster truck safely and transport them to the final point without crash or damage in this crazy driving sim game. A mad car riding adventure and monster truck transport duty will let you enjoy an amazing robot simulator game of 2017. Police Car Robot Superhero-Transport Sim is the best 2017 adventure simulator game for those who love fast drift driving, parking, truck transportation and love seeing ultimate robot transformation. 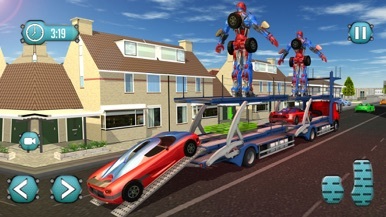 Police Car Robot Superhero-Transport Sim will let you play the role of futuristic truck transporter of grand city that has to transport extreme furious car and transformer robot to destination. 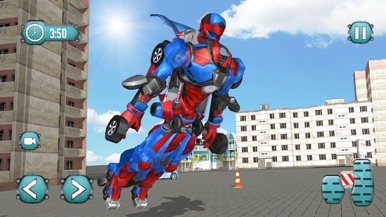 Your crazy speed car driving and mad parking skills would be tested heavily in Police Car Robot Superhero-Transport Sim. Exhibit crazy driving ability, mad car parking skills and futuristic X-ray steel robot handling power in this crazy driving sim. Drive monster trailer vehicle with extreme care and don’t hit the traffic and citizen on the road. Don’t let the car and transformer steel robot get crash or damage during transportation duty. Be the real transport hero of big city and drive car and giant mech as a real truck driver in the most amazing truck transport sim of 2017. Handle mech and drive furious car at high drift speed as an xtreme crazy driver and park them on the monster truck. Navigate properly and park your heavy duty multi truck to the final point safely. Robot car drive and monster truck transport duty has time limitation and you need to fulfill your duty within the time allotted. Enjoy furious car drift power drive, amazing transformation and truck transportation in best driving sim game of 2017. 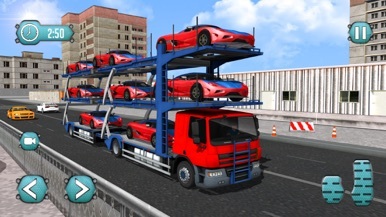 Make an epic car robot transport story by performing your transport duty as a real hero in an exciting truck driving simulation of 2017. A very simple to use xylophone for kids. 100% ad-free. The Kawaii! Sticker Pack with friends, pets, and lots of love to share with everyone. Enjoy!